In Alabama, Doug Jones scrambles to assemble a winning coalition. Democrats feel momentum in Alabama, but they’ll need black and white voters to beat Roy Moore. Jones greets supporters at Alabama State University in Montgomery. BIRMINGHAM, Alabama—Roy Moore currently leads in the latest polls of the Alabama Senate race, and has led every public poll released in the past week. But on the ground in Alabama it feels like Doug Jones has the momentum in these frenzied final days of the campaign. Part of this is due to Moore’s absence. The controversial Republican—accused of molesting a 14-year-old and pursuing sexual relationships with other teenagers as a man in his 30s—has vanished from the campaign trail. His last public event, a rally with former White House strategist Steve Bannon, was on Tuesday. Since then, he’s been a ghost of a candidate, present only on the airwaves. Jones, by contrast, is on a tireless schedule of events and meetings, criss-crossing the state with high-profile Democrats like Sen. Cory Booker of New Jersey and former Massachusetts Gov. Deval Patrick. 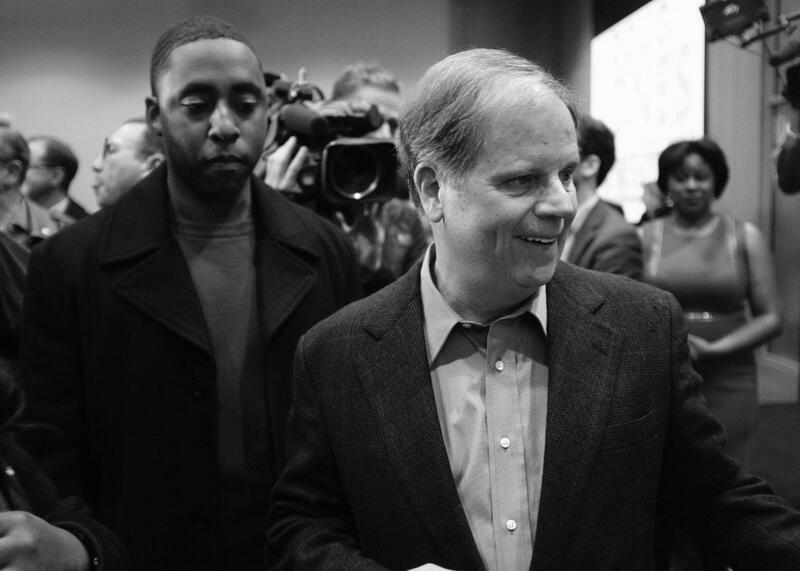 On Saturday, Jones held events in Selma, Montgomery, and Birmingham, urging supporters to do the hard work that marks the end of every campaign: making calls, knocking on doors, and bringing people to the polls. On Sunday, Jones visited churches in the Birmingham area, held a get-out-the-vote event at his Birmingham field office, then headed to Huntsville to attend a community meeting and rally supporters. “Those places” are the black enclaves of Alabama’s Black Belt, named so for the quality of its soil. While the large majority of black Alabamans who are registered say they will likely vote, the Black Belt’s poverty and isolation make it difficult to mobilize voters. High turnout there is critical to Jones’ chances, and groups on the ground are working hard to make that happen, but there are real obstacles. “[Voter ID] has been a problem in the Black Belt areas because those are rural areas, and they have to drive a distance to get to the ID offices,” explained Kynesha Brown, who was working in the Montgomery area to mobilize voters in low-turnout areas as part of “Roll to the Polls,” an effort to bring people to the voting booth on election day. Following the investigation, Alabama agreed to increase hours of operation for driver’s license offices in the region. But without early voting, weekend voting, or robust mail-in voting, the state is still a place where it’s difficult to vote if you lack the time or resources to get identification and get to the polls. Which means it’s a state that actively burdens a large portion of its black population. All of which gets to why this race is so difficult for Jones—why, despite momentum and an absent opponent, he’s still an underdog. Alabama is deeply racially polarized, and white Alabamans give the vast majority of their votes to Republicans. That polarization has helped make the GOP functionally the “white” party and the Democrats the “black” one. It’s part of the basic structure of the state’s politics, and informs decisions like the one that shuttered driver’s license offices in the Black Belt. Those decisions stand to depress black turnout and make Jones reliant on a certain proportion of white voters who might not otherwise be inclined to support a pro-choice Democrat. For all the attention heaped on black voters, whether Doug Jones can win will depend on whether white Alabamans cross a line that’s as much racial as it is partisan.